Tens of thousands of people took to the streets for the third annual Women’s March. What are the limits of the electoral strategy put forward by leaders? On Saturday, thousands of people took to the streets for the Women’s March, originally a product of the popular repudiation of the Trump Administration’s policies and Trump’s misogynistic remarks. Much smaller than previous marches, and much more divided, the Women’s March still organized tens of thousands of women across the country for the third year in a row. Although the Democratic National Committee did not sponsor the march, some Democratic Party representatives spoke at rallies around the country: presidential contender Kirsten Gillibrand spoke in Iowa and Alexandria Ocasio Cortez spoke in New York City. This year’s Women’s March took place on the 29th day of the government shutdown, which has left hundreds of thousands of people on furlough or without pay. The labor unions have been entirely complacent, with labor leaders actively discouraging strikes. 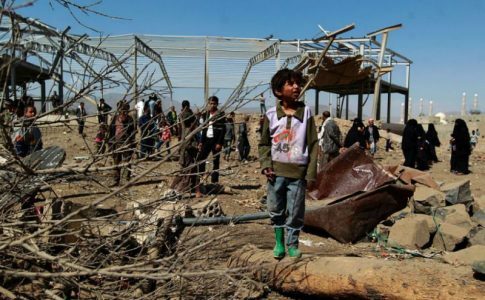 This Women’s March also comes about as thousands of Central Americans continue to wait at the U.S.-Mexico border in Tijuana, forced into migration by the imperialist policies of both Democrats and Republicans, from funding a border wall to supporting coups that toppled Central American leaders to the super-exploitation of workers by US corporations. 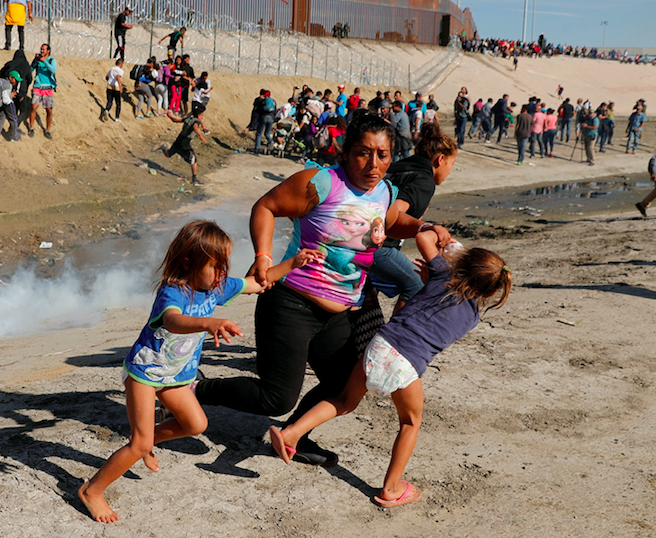 Some of the most iconic images of the caravan were of women with their children being tear-gassed by the Trump administration. And at the same time, Los Angeles teachers are currently on strike, part of a strike wave in a sector of the working class that is overwhelmingly composed of women. Despite the important political context, what took center stage were the accusations of anti-Semitism lodged against the Women’s March organizers, particularly Tamika Mallory, for meeting with Nation of Islam leader Louis Farrakhan, who is known to make homophobic, sexist and anti-Semitic statements. Similar accusations have been lodged against Linda Sarsour, both for supporting Mallory and because of her activism regarding Palestine. In New York City the Linda Sarsour and Tamika Mallory sector of the Women’s March called a rally in one part of the city. The Women’s March Alliance, aligned with Wall Street and strongly opposed to BDS, organized a march in another part of the city. Whether divided by accusations of anti-Semitism or united as it was over the past two years, the Women’s March has repeatedly demonstrated that it does not take action for the overwhelming majority of women: working-class women. While there are left sectors who participate in the Women’s March, the message that the leadership passes onto the thousands of participants is that the working class and oppressed must wait until elections and place our future in the hands of capitalist politicians. elections, of taking the power of women organized in the streets and siphoning it off into the Democratic Party. In the midst of all of this controversy, it is clear that our form of feminism must be on the side of Palestinians, despite right-wing attacks that attempt to equate anti-Zionism with anti-Semitism. At the same time, our feminism must also oppose anti-Semitism, which has been on the rise, most clearly exemplified by the recent attacks on a synagogue in Pittsburgh. 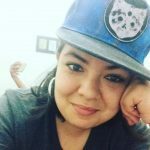 Our feminism must be actively on the side of the working class—currently unable to pay the bills because of the shutdown—as well as on the side of undocumented women currently at the border. And it must be on the side of the LA teachers, fighting for their own working conditions and the learning conditions of working-class students and students of color. 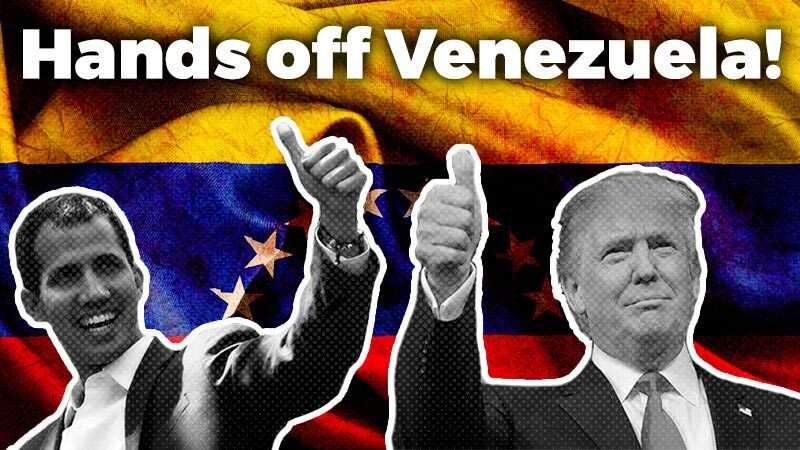 This means our strategy can’t be to wait for the goodwill of politicians, but to take the streets, to organize strikes and to support strikes. Rather than hoping that capitalist politicians will push through reforms, our feminism must move towards a complete uprooting of the parasitical system that profits off of our labor, paid and unpaid. The Trump Presidency is characterized by rhetorical and policy attacks on women, the working class, and other sectors of oppressed people. 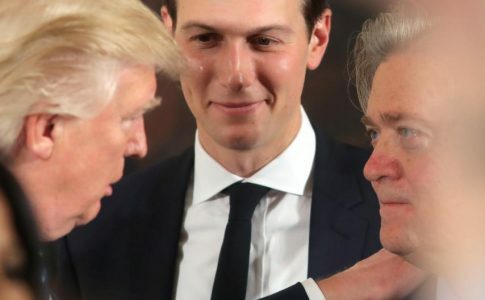 Despite two years of the Russiagate investigation and the entirely inappropriate and over-the-top comments and behavior of the President, Trump continues to govern with the support of Republicans—and even of the Democrats who don’t want to see him impeached. Although Trump has had to retreat from some of the worst attacks, he has won decisive battles: known sexual predator and devout anti-choicer Brett Kavanaugh was placed on the Supreme Court despite mass repudiation, and massive tax cuts were given to the wealthiest Americans. Despite Trump’s antics, the U.S. capitalist class has benefited tremendously during his presidency. The working class—particularly women, immigrants and people of color—have borne the brunt of Trump and the years of austerity measures imposed by the capitalist class after the 2008 crisis. This is most recently made evident in stories from teachers, predominantly women, who are trying to make ends meet. But the working class, especially working-class women, has fought back. 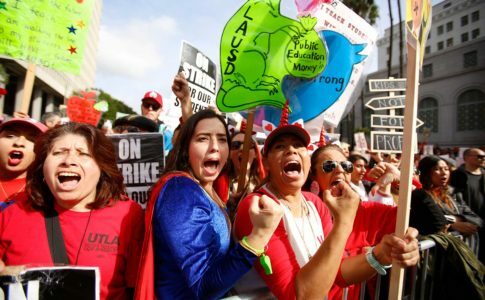 There has been a wave of teachers strikes, including the current strike action in Los Angeles, and there has been a wave of hotel worker strikes. Both of these sectors are predominantly made up of women, who are playing a central role in the rebuilding of a combative working class tradition in the U.S. It seems unlikely that it is entirely coincidental that the largest women’s mobilizations in U.S. history—the largest mobilizations in decades—take place in the same time period that sectors comprised predominantly of women organize their first strikes in decades. Might these have been an unintended consequence of the Women’s March and the increased mobilization of women in the streets? 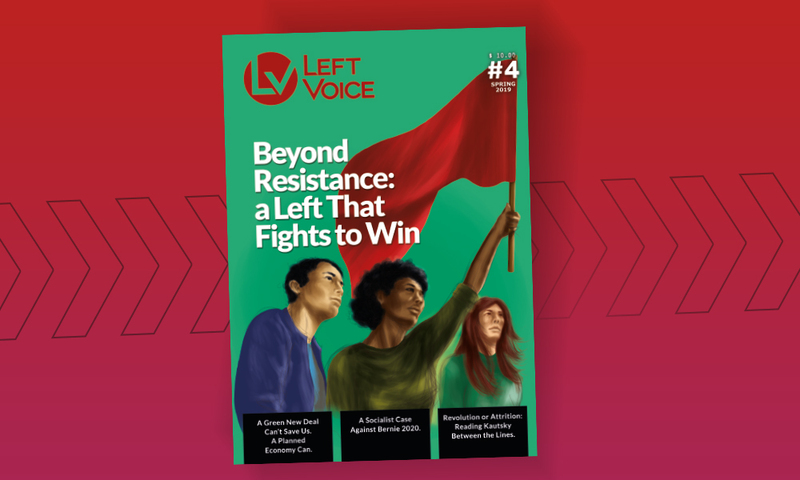 Around the world, there has also been a revitalization of the women’s movement, often facing off against the threat of the right: the Ele Nao movement in Brazil against Bolsonaro; the struggle for abortion rights in Argentina and Ireland; and the strikes organized in countries like Spain and Uruguay on International Women’s Day. Although there have been some important successes around women’s rights, internationally, these marches been unable to create a sustained and combative movement in the streets on the level of the recent Yellow Vest movement in France. Since its inception, the Women’s March has been subject to criticism. 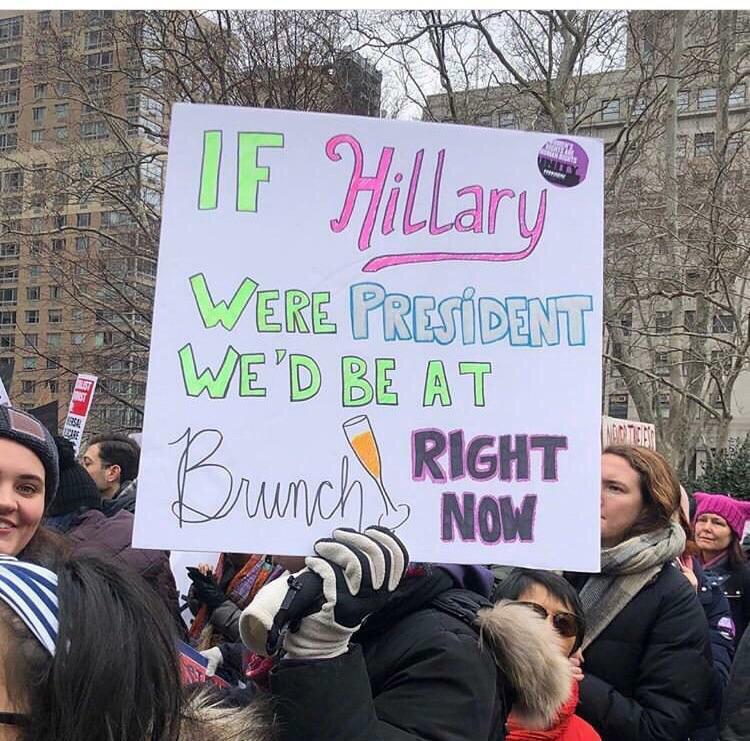 On the one hand, many found fault with the march for being overwhelmingly white and reflecting the ‘Hillary Clinton’ sector of the women’s movement. The photo below embodies this sector of feminism, which sees Donald Trump as the origin of evil and ignores the systemic abuses of American capitalism that existed far before his hateful campaign and election. This is the epitome of “lean-in feminism”, a model of feminism that focuses on breaking the glass ceiling and assuming that women in power, regardless of their politics, will fight for the rights of all women. The Women’s March leaders argue that the success of the marches is measured by the electoral wins of women in recent years. “You can draw a direct line from the five million who marched that day and our effort after that to impact elections to the makeup of the current Congress as the most diverse Congress that’s ever been elected,’’ said Vanessa Wruble, one the organizers of the first march. Just last week Bob Bland, one of the organizers, said, “These are the leaders we’ve been waiting for. We always wanted to see these women become the face of our leadership and the face of the nation, and I think that’s what we saw in the midterm elections, where we saw a historical outpouring of thousands of women running for office.” AOC and the organizers of the Women’s March (on both sides of the anti-Semitism accusations) agree on this central position: the change we need happens in the halls of Congress by electing members of the Democratic Party. This exuberant rhetoric leaves out the fact that last year, right after the Women’s March, the previous government shutdown ended without a single protection for Dreamers; then, only months later, undocumented children were being separated from their parents. It ignores the fact that the ‘most diverse Congress ever’ has not called for a single mobilization against the border wall or the government shut down. 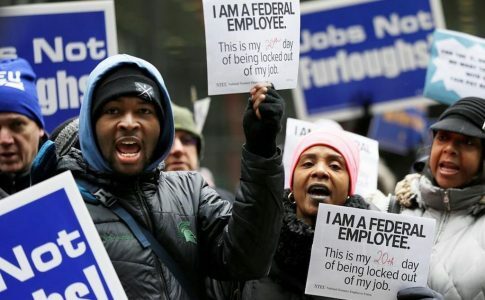 They have not demanded that labor unions call strikes against the shutdown. And the ‘most diverse’ sectors of Congress voted affirmatively to continue funding for the Department of Homeland Security, including funding for ICE. The electoral strategy pushed by the Women’s March is predicated on the belief that the Democratic Party—a party that gets its nourishment from Wall Street, Zionist lobbyists, Goldman Sachs, and the military-industrial complex—will break with this legacy to govern in favor of the working class— an idea that is hopelessly utopian. It is likely that the Women’s March, as well as the other anti-Trump marches that have taken place in the past two years, has had a catalyzing effect for sectors of women in the working class. 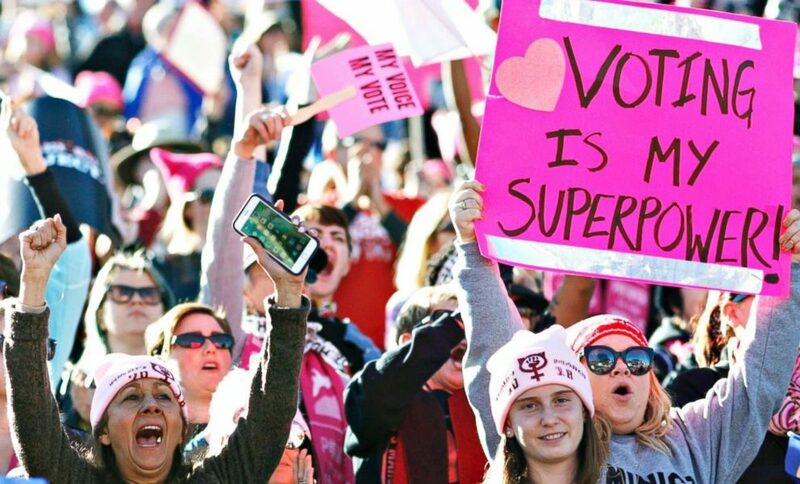 Despite the march organizers’ determination to use it to ‘get out the vote,’ hundreds of thousands of women across the country mobilized for the first time in their lives. Thousands of these women—including those in red states—later voted to go on strike, making up the massive teachers strike wave which now includes Los Angeles and Oakland teachers, as well as strike preparations in Denver and Virginia. The teachers strikes are powerful steps taken by a U.S. working class that has laid dormant for decades—a working class whose organizational structures were destroyed by neoliberalism and the austerity policies of both Democrats and Republicans. The present weakness of the U.S. working class and subservient nature of the labor unions is exemplified by the hundreds of thousands of workers who are furloughed or working without a paycheck. We need a women’s movement at the service of the teachers strike and these government workers, one that is conscious of the catalyzing effect it could have for class struggle and the solidarity it could show with a strike that is entering its second week. The Women’s March could have moved us towards building such a movement; it could have shown that tens of thousands of people around the country support LA teachers, or it could have demanded a strike from the union leadership. In this sense, our feminism must be one of class struggle. Our feminism must be socialist and it must be revolutionary, seeking to change everything about this rotten system to the core. We must organize against and actively oppose the “lean-in” feminism of Hillary Clinton and her supporters. At the same time, we must also reject the reformist feminism of Ocasio Cortez, which despite putting forward more progressive policy proposals, continues to ask that we trust members of Democratic Congress to win our rights. Neither of these can resolve the deep inequalities and abuses that working-class women suffer on a daily basis. To counter a feminism of faith in government representation with a socialist feminism of class struggle, we must have a class-based understanding of society. Imperialism, the racist prison system, and the massive exploitation of working-class people will not be resolved by replacing men who rule for capital with women who rule for capital. The problems of the overwhelming majority of women—of the oppressed and the working class—cannot be resolved with piecemeal reforms, but only by overthrowing the system that nourishes itself from our vastly underpaid and unpaid labor.